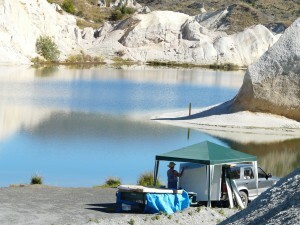 The Blue Lake, St Bathans, 2010. There are always stories associated with painting on location.In this painting trip…… it was hot,(notice the shade tent). A group of people decided it was cool to jet ski,(bang! went the reflections). A wedding,( on the exact spot I was painting). Yes I did finish it. 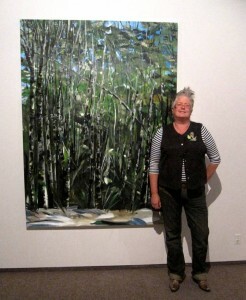 Standing beside my ‘Young Beech trees on Rowallan Road’ painting. Speaking about my paintings to interested exhibition visitors. 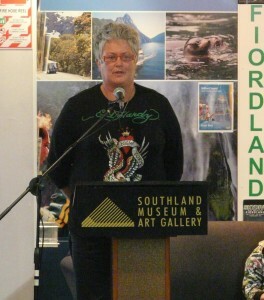 Speaking at the opening of my latest exhibition ‘Location-Vocation’ at Southland Museum & Art Gallery in Invercargill. Some places that I find to paint in I keep quiet about, untill I have finished a body of paintings. This is one such place. 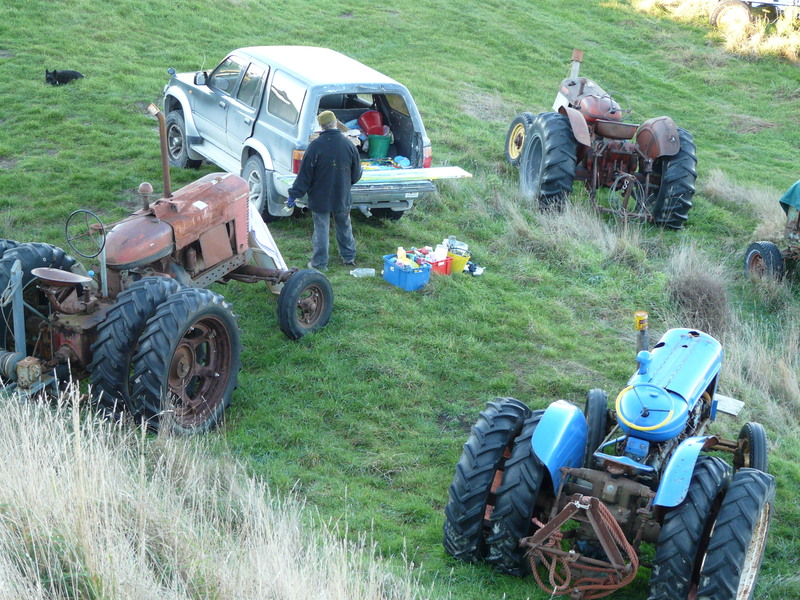 So sorry, you will have to wait til I get tractors out of my system this winter, weather permitting of course. 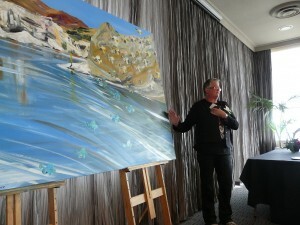 As part of this festival I was asked to speak about my life as an artist to 100 hungry people. ‘Remember the art that you buy doesn’t have to match your curtains, your lounge suite or your carpet – it will outlive them all!! ‘ This being part of my talk, I am available for guest speaking at functions etc for a small fee to cover travel and time. This painting was accepted for the Adam Portraiture Award and was on show at Shed 11, Queen’s Wharf, Wellington Waterfront. 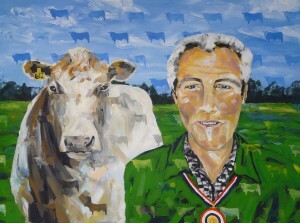 It shows a Murray Grey Stud farmer with one of his breeding cows standing behind him. He is painted on location, in a typical Southland landscape of green paddocks lined with 100 year old macrocarpas. The farmer is wearing his highly valued, prize winning A & P show medal but still remembering the spirit of the stud. Greetings all, after a very adventurous year, its back to working as a fulltime artist, travelling around the south of New Zealand to the windy raw places, the places we drive by, because it’s too cold to get out of the car. The ‘Shape of things to Come’ at Gallery De Novo in September just passed was an important exhibition for me in that the mastectomy changed the way I work both mentally and physically. In this show, to bring another dimension to the work, I linked the subject with the area connected to it, eg. Early sailing ships in the Otago Harbour. Also the show illustrates my continuing fascination with my art n mind shapes, this time including ceramic work on the subject of cows and what happens to the environment. Painting Workshops I’m involved in coming up are Rhododendron Festival, Painting around Lawence, Art in the Gardens at Roxbrough and lots of school residencies. Including Snail Mail postcard exhibition to be held in November at Macandrew Intermediate School. The womens brain injured art group supported by CARA continues to be ongoing. After the success of the Riverton Dutch Show and James Hargest School shows down south, I’m happy to be back in Dunedin. Head down bum up. Working on new work for a big exhibition at DeNovo gallery this coming August. Also now available for giving art work shops both here in NZ and over seas. For overseas people, I can take you on Art Safaries, four wheel driving and painting in those special spots that you would not normally see. Adventures with fun, food, wine and art. Prices to suit your budget. Riverton Community Arts Centre – Riverton, Southland, N.Z. Acknowledging her Dutch heritage has inspired artist Janet deWagt to create art works that reflect her love for her father’s native homeland. “From Across the Seas” celebrates her father’s journey to New Zealand, bringing with him his Dutch culture and family history. The imagery that her Father brings is the imagery of the 1950’s frozen at that point in time. All travellers to New Zealand have to come ‘over the seas’. 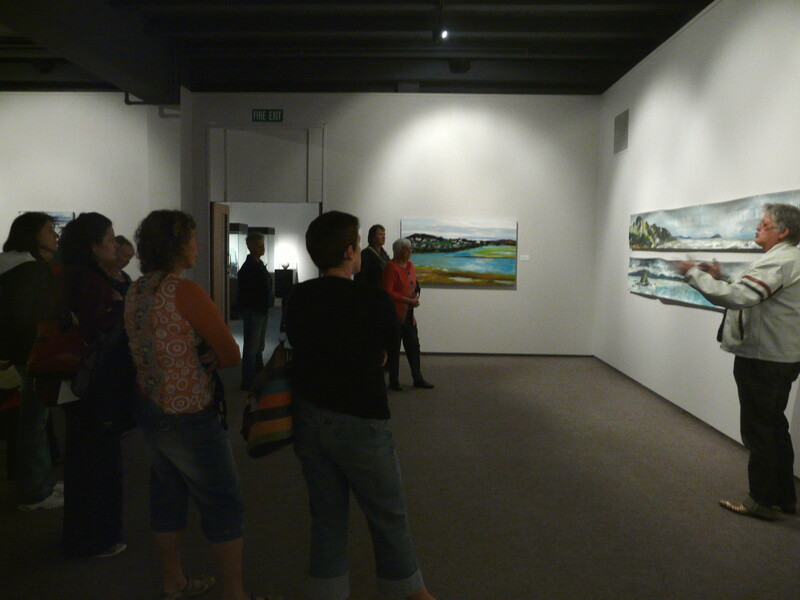 With this in mind Janet has merged these visual images with her family history and her sense of New Zealand identity. 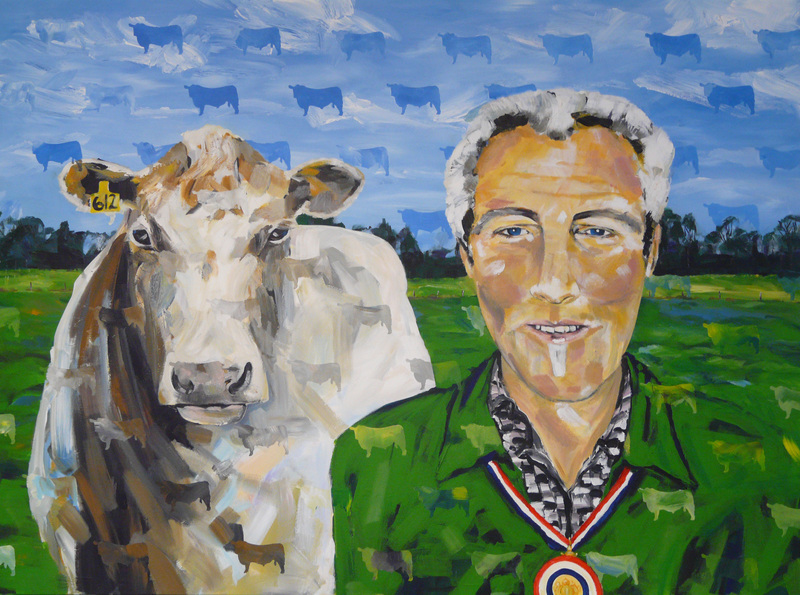 The wave of Dutch immigrants in the 50’s is celebrated in Janet’s exhibition. As a kiwi child the family “across the seas” were symbolised by photographs, letters, Dutch food, and Dutch Gin! “I might have been brought up as a Kiwi, but genetically I can’t fight my gene pool” While it was a shock to Janet, her recent diagnosis of breast cancer has allowed her to add a twist to this exhibition. Janet acknowledges her cancer in her artworks and the “journey” that the disease has also travelled throughout her Dutch whakapapa and family history. Although I cannot speak Dutch, I haven’t escaped my Dutch genes and this has been made more significant by the diagnosis of breast cancer and subsequent mastectomy. Like Rembrant’s women, Janet is larger than life, her artworks reflect the energy, beyond the black and white shadows, putting the process in a visual context through Rembrant paintings. The glass hearts symbolise the shadows on the walls, continuous words from her childhood, Friesland and Dutch, the difference in language and in someways they appear as completely different countries. The Friesland canal boat bobbing around on a huge a Pacific Sea, symbolises what happened to a lot of the Dutch when they came here, “just bobbing up and down”, very isolated. The old traditional Dutch symbols slowly disappear and the ‘free’ symbols of New Zealand birds take over – in part my father always liked birds! I have used copper leaf and gold leaf, as that symbolises “old Dutch” for me. My father in his army uniform, shows what he left behind, his family, way of life on a small farm, and he was coming to a big unknown. He knew he would be working on a farm, hence the ‘sheep’. The Kiwis reflect Dutch colours, Dutch lace – the homeland, held together in memories, the past of the homeland is contained in the present. “From Across the Seas” exhibition is only the part of this journey. Janet has begun a large body of work which will continue expanding and travelling to other centers. As part of this process Janet is in the process of seeking a residency in Holland in order to further expand and develop the visual imagery of Dutch Migration to New Zealand exploring the Dutch view of immigration to the ‘other side’. At present I’m at Macandrew Intermediate School, Dunedin, New Zealand, as an Artist in Residence. I have an open door policy with the students and staff, in my classroom/studio where I produce my work for my upcoming exhibitions. My latest studio work is based on Dutch journeys to New Zealand in the 1950’s for an exhibition at Salisbury House Gallery. The annual Snail Mail Exhibition is in the process of being organized again for 2008. Artists can send work of a post card size to be included in the exhibition. Proceeds of the sale of the post card gets split 50% to the Artist and 50% to Artquest, which helps to bring the Arts to the students of Macandrew Intermediate. Contributions to Snail Mail should be sent to the school by August 15th. Opening night is August 22nd at the school, and it runs for three weeks. For any more information about Snail Mail, Janet de Wagt Art Purchases or Community Art projects – have a look on the ‘Contact’ page to contact Janet.